Eleven and a half rounds or 95% of the fight, that was how long Sergio Martinez dominated, thoroughly dominated, Julio Cesar Chavez Jr. The last half of that last round was a hell of a ride. I openly admit to rooting for Martinez in this fight. It’s hard for me to not root for the serf over the prince or David over Goliath. I understood Martinez and his teeming, seething anger. I understood his feeling slighted by not only Chavez Jr, but the belt Chavez Jr held and who handed him that belt. Sergio Martinez fights on HBO and so it would stand that HBO would have final say on who he fights. Martinez held the WBC title and his mandatory defense was Sebastian Zbik who HBO did not approve of as an opponent for Martinez. Martinez now having HBO decline a fight with Zbik, the WBC then stripped Martinez of his title. The president of the WBC is Jose Sulaiman. Jose Sulaiman is Julio Cesar Chavez Jr’s godfather. No matter who your allegiance lies with that’s fishy (to say the least). Sergio Martinez and his crazy eyes. Martinez saw all of this for what it was, the boy with the silver spoon having that spoon upgraded to gold. It wasn’t fair and he let everyone know how he felt about the situation and Chavez himself. He said all through the promotion that he was going to destroy Chavez. That Chavez was going to need his teeth replaced because after the fight Martinez would make sure they’d be missing. That Chavez would need a doctor to identify his remains. From the first second of the first round to just about half way through the 12th and final round Sergio Martinez battered Chavez. No sense dissecting the first eleven rounds they were almost all the same. Chavez didn’t let his hands go for fear of razor-sharp combinations striking him from every sort of angle imaginable. Martinez controlled the ring like a true master. Chavez lone hope was trapping Martinez against the ropes or in a corner where he could unleash his vicious body shots. Martinez never allowed it. Martinez would always punch his way out or simply just spin around the flat-footed Chavez. The only real intrigue came from the last half of the last round. With the fight decided rounds ago and Martinez just making Chavez bleed more profusely than he already had been Chavez unleashed, and landed, a crushing blow. One of the few punches that Martinez couldn’t duck away from. Chavez put Sergio Martinez on the canvas in the final round of a fight that he was, until then, losing unanimously on every scorecard. It was shocking, fascinating, unbelievable…point is no one saw it coming. It completely changed the whole scope of the fight. Suddenly the previous eleven and a half rounds were erased and it was Sergio Martinez who was the one being battered around the ring. Dropped to the floor even. Time was ticking off the clock and Chavez was unleashing a barrage of punches to, what appeared to be, a defenseless Martinez, who refused to hold or clinch Chavez. 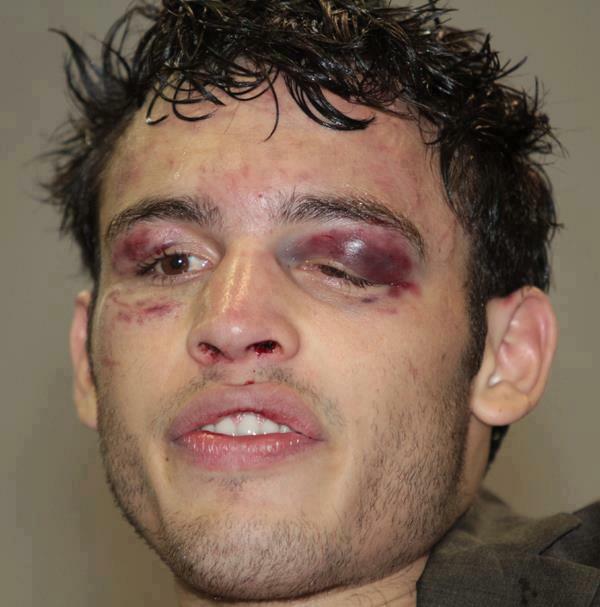 Julio Cesar Chavez Jr’s face as a result of round after round of massive punishment from Sergio Martinez. For a shade of a minute it appeared as if Julio Cesar Chavez Jr just might pull off one of the greatest and most shocking 12th round knockouts in the history of boxing. Unfortunately for Chavez it wasn’t to be. Martinez regained, if ever so slightly, his legs and composure and managed to run out the clock, if you will. If you watched the fight it’s hard not to think about that 12th round first, and don’t get me wrong it was thoroughly exciting, but it seems it made most forget about the first eleven and a half rounds. The rounds where Sergio Martinez put on a masterful boxing clinic. Many called for a rematch. Chavez landed a good punch to a (then) weary Sergio Martinez. The fight was completely and utterly one sided and it wasn’t a mistake that the fight went that way. Sergio Martinez is leaps and bounds the fighter that Julio Cesar Chavez Jr is. It’s that that would bring me to expect the same result; a clean and clear one-sided demolition of a plodding, one trick pony.